What could be more important than improving sales and your customer relationships? Called “Customer Touchpoint Management” (CTM), the goal of this new movement is to improve customer experiences, and as a result, improve customer relationships. By improving customer relationships organizations improve market share, sales, and both customer and employee loyalty and advocacy. But what exactly is a “touchpoint?” Touchpoints are all of the communication, human and physical interactions your customers experience during their relationship lifecycle with your organization. Whether an ad, Web site, sales person, store or office, Touchpoints are important because customers form perceptions of your organization and brand based on their cumulative touchpoint experiences. Savvy organizations realize that customer relationships can no longer be considered exclusively the domains of sales and customer service. If the accuracy of invoices, or the professionalism of installers or cleanliness of your store or office is lacking, then the relationship can suffer no matter how well the salesperson or “owner” of the relationship performs. Savvy organizations know that they can best enhance relationships with customers by improving touchpoints across the entire enterprise. In fact, improving your customer relationships can deliver powerful results to your organization. For example, through a comprehensive Customer Touchpoint Management (CTM) program developed to understand and improve key customer touchpoints, Avis gained market share in key travel markets and became a leader in customer loyalty and satisfaction as measured by Brand Keys and JD Powers. 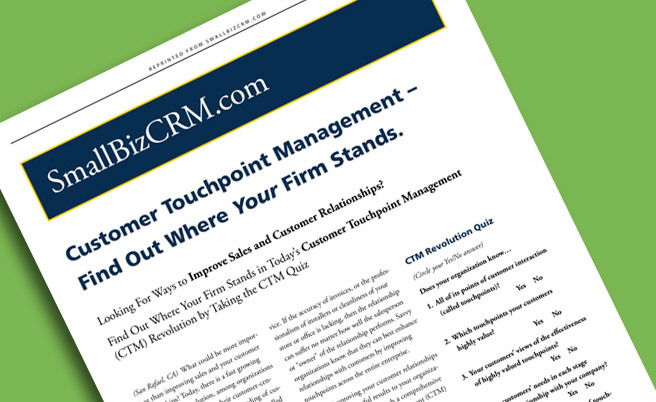 So, where does your organization stand in the growing Customer Touchpoint Management movement? Take the following six-question CTM Revolution Quiz to find out if your firm is a CTM Observer, Follower, Leader or Visionary. All of its points of customer interaction (called touchpoints)? Which touchpoints your customers highly value? Your customers’ views of the effectiveness of highly valued touchpoints? Your customers’ needs in each stage of their relationship with your company? The most common sequence of touchpoints prospects encounter as they consider your offerings? How your current customers classify themselves (for example: as dissatisfied, satisfied, loyal or advocate)? While your firm may be doing well, there are opportunities for dramatic improvement in the customer-centricity of your organization. If your approach to better understanding and improving customer touchpoints has been to observe or monitor customer service trends in your industry, you may be finding it more and more difficult to compete. New clients and strong sales may be masking poor customer satisfaction and retention issues, which could lead to a serious problem down the road. You know that improving customer-centricity will help, but your organization may be having trouble getting its hands around just how to accomplish this – you’re not sure exactly where to start. Previous efforts to improve customer experiences have generated mixed results. As a consequence, staff are highly skeptical of new programs and their ability to truly effect change. A change of culture may be required to dramatically improve customer-centricity, and you probably need third party assistance to accomplish this. Your organization is making progress on improving customer experiences and is generating some positive feedback as a result. However, you are still following the Customer Touchpoint Management leadership of others. You appreciate that you are more customer-centric than some of your competitors, but worry that you have significant hurdles to overcome to catch up to the customer service leaders in your industry. You are proud of the improvements made to date and you want to continue the organization’s positive momentum. You realize that you may need outside experts to help the firm get to the next level. A Customer Touchpoint Management revolution leader, your organization is benefiting from being ahead of the customer experience curve. You excel in comparison with the majority of your competitors. Your sales are increasing, and you have improved the retention of both customers and employees. Customers who advocate your offerings are helping to fill your sales pipeline and employees who advocate your company are helping to attract outstanding staff. You are committed to continuously improving touchpoint performance through a dynamic Customer Touchpoint Management plan, and have systems in place that enable your organization to surface and apply touchpoint best practices. Not satisfied, however, you continually look internally and externally for opportunities to improve customer touchpoints in order to improve your customer-centricity and to stay ahead of your competition. Your organization is the inspiration for the touchpoint revolution both within and outside of your industry. You have established benchmarks and best practices for developing and implementing a comprehensive Customer Touchpoint Management plan. You have developed a system of two-way communication that encourages ongoing and honest feedback from both customers and employees. Based on customer and staff input, you have established touchpoint standards and manage to those standards. Your customers consistently experience excellence in every touchpoint they encounter. Outstanding talent is clamoring to work for you and your competitors covet your employees. You are able to charge a premium for your products or services, and your corporate leaders are invited to speak about the customer-centricity of your organization. Happy to share your CTM story, you know that your success is based on an ingrained culture of relentlessly looking for better ways of understanding, improving and measuring your customer touchpoints in order to strengthen your position as a customer service leader, and to further distance yourself from your competitors. We are in the early stages of the Customer Touchpoint Management revolution. If you find your organization positioned as a CTM Observer or Follower, it is not too late to learn from the Leaders and Visionaries and to apply the concepts of Customer Touchpoint Management to improving relationships with your customers. The benefits are powerful, creating happier customers, employees and owners.